Treating young patients with bipolar disorder can be challenging, but a growing body of evidence suggests lithium may be a good place to start, Vivian Kafentaris, M.D. (pictured left), said Tuesday at the annual meeting of the American Academy of Child and Adolescent Psychiatry in San Antonio. 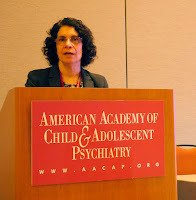 During her presentation, Kafentaris offered an overview of evidence-based strategies of off-label drugs for treating children and adolescents with bipolar disorder. In particular, she highlighted some data from the Collaborative Lithium Trials, which compared patients (aged 7 to 17 years) with bipolar I/manic or mixed episodes who were treated with lithium for up to 8 weeks with those treated with placebo. The study, which was published this month in Pediatrics, found that those in the lithium group experienced a greater reduction in manic symptoms (as measured by changes in the Young Mania Rating Scale and Clinical Global Impression–Improvement scores) than those taking placebo. Additionally, the medication was generally well tolerated and was not associated with weight gain. Although Kafentaris expressed optimism over the positive results of lithium treatment in children and adolescents with bipolar I disorder, she emphasized that more research is needed to determine the long-term effects of medication in youth.